Krea's mission is to bring the richness of the Indian theatrical heritage to the North American audience, by delivering quality shows that provide entertainment and cultural connection to our origins. Krea will endeavor to serve as a platform for the local artistic talent to participate, entertain and be recognized. After a brief hiatus, Krea is coming up with their next production Chillu written by the famous writer Era Murukan. Chillu will be staged on November 14th in San Diego for the San Diego Tamil Sangam and on November 22nd, in the Bay Area for Bharati Tamil Sangam. Chillu was inaugurated in India in September. 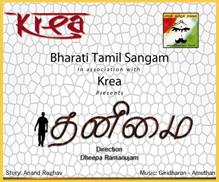 Sri Thenandal Films, a popular film production company along with Shraddha theaters and Krea produced Chillu. The play was very well received in India and many celebrities attended the play. Art director V.Selvakumar designed the sets, Kavita Baliga scored music and Preethi Kanthan designed the costumes. The first look of the poster was revealed by Actor Vijay Sethupathy and Padma Bhushan Dr. Kamal Haasan watched the motion poster created for the play and appreciated. Like our Facebook page. In this page we will have constructive discussions on the plays we stage here as well as in India. You can post your suggestions and comments on the ways to improve the quality of Tamil theater. If you have said Yes to any of the above, you are the one we are looking for..
Krea is actively looking for volunteers to help facilitate several aspects of delivering quality shows. If you would like to give it a try on or off stage, we would like to hear from you. We conduct auditions about six months before unveiling a new production. Copyright © 2008 Krea, All rights reserved.